If an adult in your life has cancer that has metastasized (traveled to another place in the body from where it originally appeared), you may want to learn more about it. 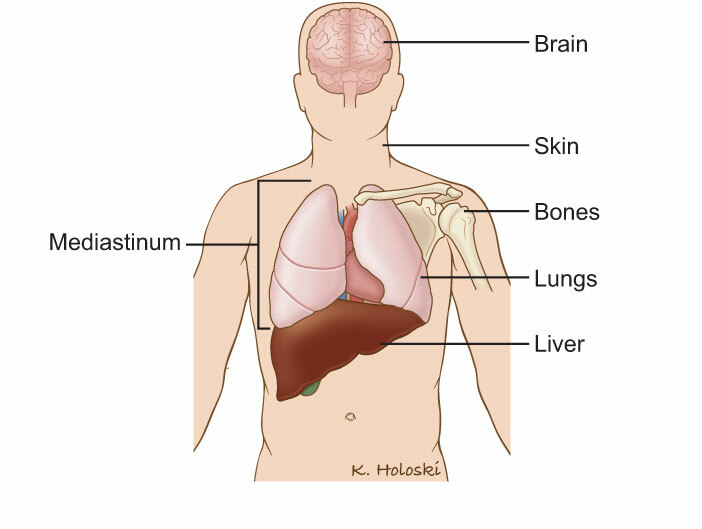 This page has information about distant metastasis, its types and what to expect. First, you should understand what cancer is. Cancer is a disease of unhealthy cells. Our bodies are made of cells so tiny you need a microscope to see them. Cancer cells don’t look or act like normal cells, and they don’t allow our normal cells to work properly. There are many different types of cancer that can grow anywhere in the body.1 Ferlito A, Shaha AR, Silver CE, Rinaldo A, Mondin V. Incidence and sites of distant metastases from head and neck cancer. O RL J Otorhinolaryngol Relat Spec. 2001;63(4):202-207. Distant metastasis in head and neck cancer—the spread of cancer to other parts of the body—makes beating the disease much more challenging. The goal is to try to stop the cancer from spreading and causing complications. Certain tumors are more likely than others to metastasize. This includes adenoid cystic carcinoma, basaloid squamous cell carcinoma and neuroendocrine carcinomas (such as Merkel Cell carcinoma).1 Ferlito A, Shaha AR, Silver CE, Rinaldo A, Mondin V. Incidence and sites of distant metastases from head and neck cancer. O RL J Otorhinolaryngol Relat Spec. 2001;63(4):202-207. Over the past few decades, doctors have made big advancements in eliminating primary tumors and their spread to lymph nodes in the neck. This is called locoregional control. But long-term survival has not changed much. One possible reason for this is while locoregional control has gotten better, the rate of distant spread of the cancer has not changed (or may have even increased as patients with locoregional control live longer). To understand distant metastasis, you need a basic understanding of the anatomy (parts) of the head and neck. Distant metastases in head and neck cancer are defined as tumor cells that come from a primary tumor in the head and neck and then spread to a location away from the head and neck. Exactly how tumor cells travel from one site in the head and neck to another site in the body is not totally clear, but there are a few theories.2 Allen CT, Law JH, Dunn GP, Uppaluri R. Emerging insights into head and neck cancer metastasis. Head Neck. 2012. One is that tumor cells from the primary tumor drain into the lymphatic system (the extensive drainage network that keeps bodily fluids in balance and defends the body from infections) and enter regional (nearby) lymph nodes. Once in a lymph node, the tumor cells can then go into the bloodstream through the lymph node itself or be picked up and carried elsewhere when the lymphatic fluid goes through the lymph nodes and drains into the veins. Another theory is that tumor cells go into the bloodstream from around the primary tumor itself. Then the cells can move into different parts of the body and develop into distant metastasis. This happens in rare cases where there is no cancer in the lymph nodes, but the cancer appears in a distant site in the body. The diagnosis of distant metastases of a head and neck cancer is most likely to be made at initial diagnosis or during follow-up treatment. Initial cancer diagnosis, prior to starting treatment: Metastases can be found during a pretreatment chest X-ray that shows a nodule, a PET scan that shows an active area somewhere in the body, a CT scan that includes the lungs and identifies a nodule or sometimes even in laboratory tests (such as liver function tests or LDH levels). During follow-up after treatment: More commonly, after treatment has finished, the patient will continue being monitored to see if the cancer has come back or spread. If there is a new symptom that raises the concern for a metastasis (e.g., new onset bone pain, coughing up blood), the doctor will look to see if a tumor is causing the problem. Even if there are no symptoms, the doctor should perform routine chest X-rays, imaging tests, PET scans or lab work to look for any evidence of metastases for several years after treatment is completed. Once there is some concern for a distant metastasis, in many cases the doctors will recommend getting a biopsy to confirm the diagnosis. Not only will this determine if the diagnosis is cancer, but pathologists can also look at the cells under the microscope and do some special stains to help determine if the cancerous cells are similar to the cancerous cells in the head and neck tumor. There is always the possibility that a cancerous nodule in the lung (for example) is actually a new lung cancer totally different from a previously treated head and neck cancer. As good as biopsies sound, there are a few problems. First, biopsies are not 100 percent accurate. A biopsy could show that a growth is NOT cancer when it really is; this is called a false-negative biopsy. A false-positive is also possible when the biopsy seems to show that a growth is cancer but more testing shows it isn’t. Sometimes doctors can’t be completely sure a tumor is cancerous from a biopsy. Distant metastasis of a head and neck cancer is staged as M1. For most cancers, this classifies the cancer into stage IV. The exception is for well-differentiated thyroid cancer if the person is under the age of 45; even if there is distant metastases, it is still only stage II. The treatment of distant metastases from a head and neck cancer will include an in-depth talk with a specialist who deals with this disease. The patient will talk with the care team about the options and the possibility of going into a clinical trial at an academic cancer center. Surgery might be the treatment chosen if there is a single spot of metastasis in one part of the body. Other reasons why surgery might be recommended are if the primary tumor has been completely removed, the spread to a distant site is very limited and the tumor can be completely removed with the surgery. Radiation can be considered for the same reasons as surgery. It is especially common to treat the spread of cancer to spinal bones with radiation if it is causing pain. Still the most common treatment method for distant metastasis is chemotherapy and/or biologic therapy. A cancer that has spread to a distant site has gotten into the blood, and there may be tumor cells throughout the body. By giving a drug that moves throughout the body, the hope is that it will stop the tumor cells growing in distant locations as well. The exact drugs used depend on several factors, and the patient will discuss them with an oncologist. The prognosis is a prediction of how the treatment will turn out. How likely is it that a person with cancer will be cured? Will the cancer come back? How will life change? These are the big questions on most people’s minds when they find out that someone they love has metastatic head and neck cancer. The prognosis of patients with metastatic head and neck cancer is generally not as positive as it is for localized cancer. Treating cancer that has spread to other parts of the body is more challenging than treating localized cancer. However, every case is different, and there is always hope. It is also very difficult to discuss prognosis without understanding all the details of the cancer. Your loved one should discuss the possible outcome of the cancer treatment with his or her doctor. After making it through treatment, your loved one will need to follow up closely with the doctor. Follow-up doctor visits and testing are to make sure the cancer doesn’t come back or to catch it quickly if it does. The goal is obviously to eliminate the cancer, but in some cases, just keeping it at bay and preventing any symptoms that make quality of life worse are also reasonable goals. 1 Ferlito A, Shaha AR, Silver CE, Rinaldo A, Mondin V. Incidence and sites of distant metastases from head and neck cancer. O RL J Otorhinolaryngol Relat Spec. 2001;63(4):202-207. 2 Allen CT, Law JH, Dunn GP, Uppaluri R. Emerging insights into head and neck cancer metastasis. Head Neck. 2012. 3 Leemans CR, Tiwari R, Nauta JJ, van der Waal I, Snow GB. 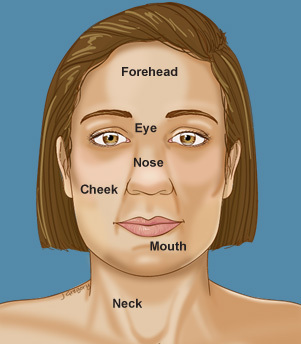 Regional lymph node involvement and its significance in the development of distant metastases in head and neck carcinoma. Cancer. 1993;71(2):452-456.